Dragon Rider and Dragon Rider: The Griffin’s Feather. These books are about a dragon named Firedrake and a kid named Ben. Near the end of the first book Ben finds out he is the Dragon Rider and what that means. In book one Firedrake is looking for the original home of the dragons: The Rim of Heaven, and Ben helps him. Ben and Firedrake in book two are looking for a griffin’s sun feather than can make everything grow to save the last moon feathered peagasus. I like these books because it reminds me that just if you can’t see something that does not mean it is not real. I recommend these books to people who like dragons, adventures and monsters. I read this but because I haven’t read the Wings of Fire book series, i didn’t really get it. My cousin, Alexander, is a huge Wings of Fire fan so I asked him to read this. My aunt said he was super excited to do it. The illustrator is Mike Holmes and I do love his work! Wings of Fire: The Graphic Novel Book One: The Dragonet Prophecy is about 5 dragonets and a prophecy. The prophecy tells how to end the war that has lasted for twenty years. The dragonets must choose one of three sandwing queens to rule the sandwing tribe. This book follows the five dragonets as they escape and attempt to find their homes and meet all the queens so they can know all their personalities in person and not just from stories and scrolls, because you never know when to trust a scroll. In the novel Wings of Fire: The Dragonet Prophecy it says in the prologue what happens to the skywing egg and in the Wings of Fire graphic novel it shows them hatching. Both tell you different parts of the story, so you should read them both. Other than the prologue, the stories are the same. The characters in the graphic novel don’t look like the characters on the cover of the original book. The graphic novel has a nice story line. The illustrations are very detailed and look even cooler than they did in my imagination for some of the dragons. I think people who like dragons, fantasy and prophecies and escaping would like this book. People who trust scroll could learn from this book series. This book is about magic books and a girl. It also involves Peter Nimble. The magic books are basically the bad guys but the story guards think they are good. 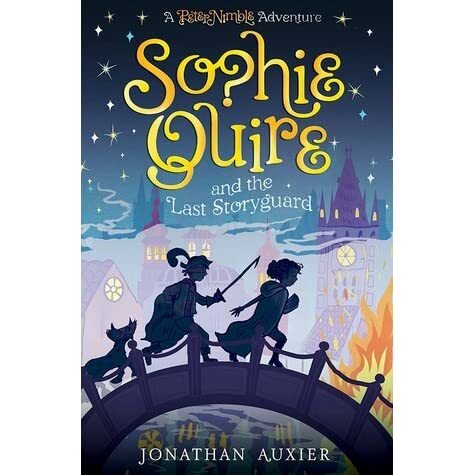 So the girl’s name is Sophie Quire and she is the last storyguard until the end when the magic books are destroyed to stop the bad thing the books made. People who like magic and “D & D” (Alex note Dungeon and Dragons) will like this book. This book get 20 stars from Alex and 40 stars from Bridget for a total of 60 stars. This is a guest review/Bridget review. Bridget: Peter Nimble is a blind boy. In this story he gets a pair of fantastic eyes. One, the onyx one, turns Peter into the last animal he touches. He thinks he should never touch a snake, or he won’t be able to get the eyes back out! SPOILER ALERT!!!! SPOILER ALERT!!!! SPOILER ALERT!!! !My favorite part is when he finds out that he is the true heir to the Kingdom of Hazelport, Prince Noname. Guest reviewer Alex: My favorite part is when he used his bare hand to defeat the armor that the imposter king was wearing. He hurt his hand so badly it couldn’t be fixed so it had to be replaced with a silver fishhook that he uses as a sword! Both: We think that people who like kingdoms and fighting and adventures and Dungeons and Dragons would like this book.